Donna Dawson, age 101, died Sunday morning January 13, 2019 at home. Born June 20, 1917 to Don G. & Marguerite (McBride) Echelbarger, she resided in Shelby but grew up in Plymouth. 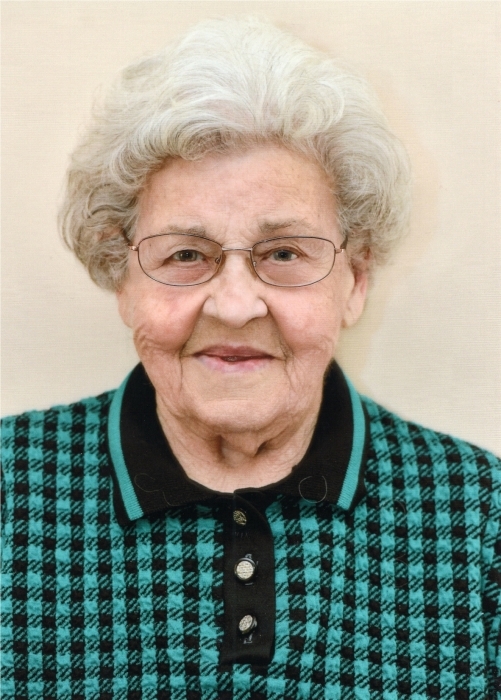 A 1936 graduate of Plymouth High School, Donna attended the Mansfield Business College and worked for 25 years in the office at the former Shelby Spring Hinge Company. She was a 80 year member of the Ruth Chapter O.E.S. and served as Worthy Matron in 1942 at Plymouth Chapter and District President in 1948. Donna was also a member of the Naomi White Shrine, former member of the Hazel Grove Grange, Ladies Aid Club and Richland Co. Fairboard Ladies Auxiliary. She enjoyed working jigsaw puzzles, search and find puzzle books and watching TV game shows. Donna learned how to milk cows at her grandparents farm in Shiloh, which prepared her when she married her husband, Orva E. Dawson Sr., as she helped him on their dairy farm until his retirement. Donna is survived by her children, JoAnn M. Hastings and Orva (DeeDee) Dawson Jr. all of Shelby and Lynn (Elaine) Dawson of Crossville, TN; grandchildren, Melissa (Doug) McCandish, Brad (Michelle) Hastings, Stephnie (Brian) Kennedy, Sally (Tom) Hoak, Mary Dawson, Amy Dawson, Kelly Dawson and Scott Dawson, Sherry (Brandon) Frankart, Derek (Monica) Dawson, Heather Dawson, Monica (Fiancé Ryan Davidson) Robinson, Mike Dawson, Julie (Adam) Miller, Janell (Dennis) Kershner and Dixie Dawson; 25 great grandchildren with two on the way; seven step great grandchildren; five step great great grandchildren and sister, Lucille Ross of Willard as well as numerous nieces, nephews and other relatives. She was preceded in death by her parents; husband, Orva E. Dawson Sr. in 2005; son, H. Earl Dawson; son-in-law, John L. Hastings; daughter-in-law, Peggy Dawson; grandson, Andy Dawson, her siblings, twin sister, Dorothea Arnold, Gertrude Beaty, Jeannette Broderick, Betty Gilger, Ella Jane Albert; brother, Don (Mac) Echelbarger and special friends, Joe and Rhea Maxwell. Friends may call at the Barkdull Funeral Home & Crematory in Shelby on Tuesday, January 15, 2019 from 4-7 PM with an Eastern Star Service following at 7:00 PM. Funeral service will be held at 11:30 AM Wednesday at the funeral home conducted by Rev. Russel Yoak and Gaye Shira. Interment will be held in Greenlawn Cemetery in Plymouth. In lieu of flowers, memorial expressions may be made to the Andy Dawson Scholarship Fund c/o Shelby Foundation at 142 N Gamble St Ste F, Shelby, OH 44875 or to Hospice of North Central Ohio at 2131 Park Ave W # 400, Ontario, OH 44906.